After a strenuous season on the ice, the Massachusetts club hockey team captured the Northeast Collegiate Hockey Association’s west division title on Saturday against Westfield State. Next for the Minutemen is the NECHA playoffs, which begin on Feb. 27 with regional’s. 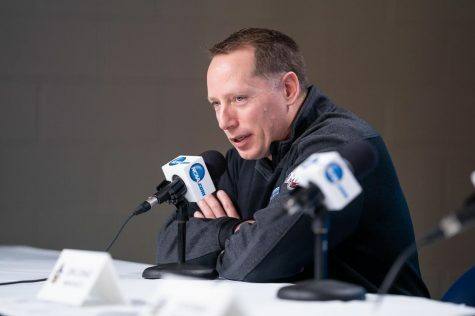 It’s been a long road for UMass (19-8-0, 9-2-0 NECHA West) since returning from the winter break, with the NECHA playoffs just around the corner. The Minutemen suffered an 11-4 loss to New York in their first game at the Mullins Center practice rink. The game against the Violets (12-14) showed little offensive production from the Minutemen, as well as a defense that couldn’t find its way around the ice. Scoring for the Minutemen during the game was senior forward Alec Goolsby, who before the break was on an offensive tear not only for UMass, but in the conference. Goolsby scored his 18th goal of the year, nearly double the amount he scored in the 2008-2009 season. Goolsby has 22 points on the year, good for eighth in the conference, and has also notched two game-tying goals, putting him in a tie for first in the conference. 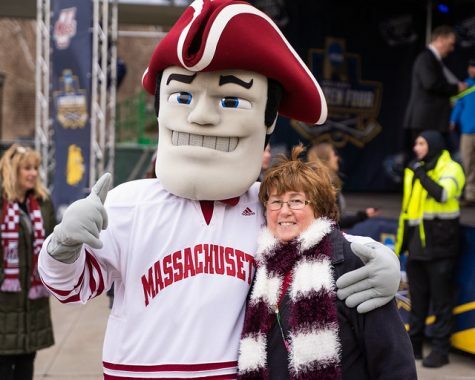 Also netting a goal for UMass in its loss against New York was forward Danny Arnao, who matched his single goal in the game with a quick assist that helped the Minutemen provide a little more offense. 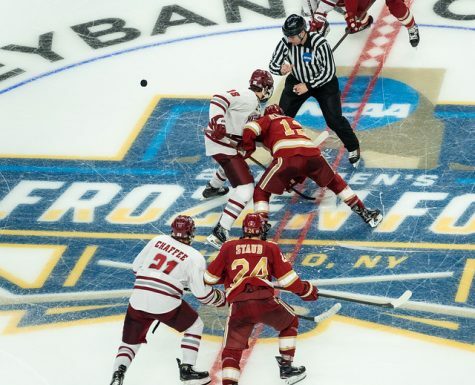 UMass’ lapse in defensive pressure could be seen in the switch between goalies in the game. Freshman Joe Iadarola split time with senior Mark Leonard during the game, with Iadarola letting up six goals amid the 35 shots taken at him. Leonard stopped 11 scores, but also allowed five goals. 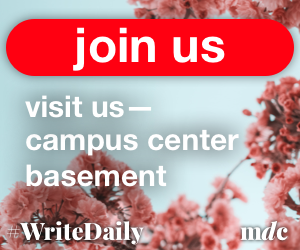 After a heart-breaking loss to the Violets, the Minutemen continued their home stretch when they competed against Western Connecticut. 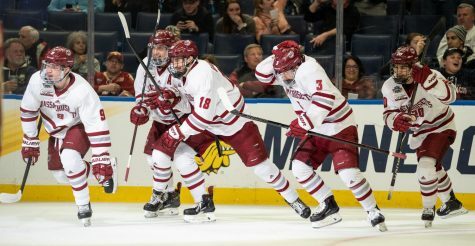 Bouncing back against the Colonials (7-4-1 NECHA West), UMass found its way to the net while protecting their own in a 4-2 victory. Similar to earlier in the season, Goolsby netted a goal for the Maroon and White along with fellow graduate student forward captain Reed Powers. Iadarola got the nod in net and was impressive, allowing two goals in the 28 shots taken. Northeastern came to the Mullins Center a week later attempting to knock-off a highly-motivated Minutemen side. 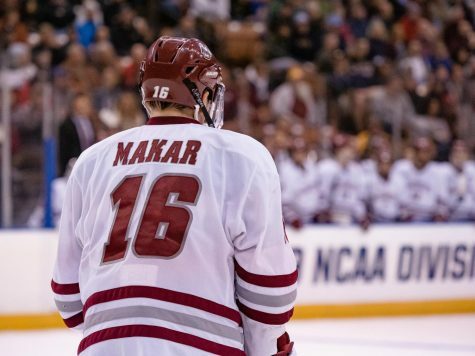 Unfortunately for the Huskies (8-3-0 NECHA East), UMass worked hard to secure their 4-3 victory. Goolsby produced offensively again for UMass in the thrilling match between state rivals. This time for the senior captain, it was from a different angle, as Goolsby had two assists during the game. Arnao found his way to the net again in the contest, along with forwards Julian Maleski and Michael Bartlett. Even the defense got in on the action to push the Minutemen towards victory, as defender Sean O’Sullivan sent the puck into the back of the net. 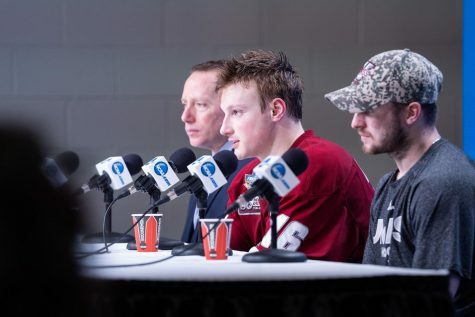 On a momentous occasion such as senior night, UMass wanted to keep its winning ways going. Bryant, who finished third in the NECHA East, proved to be too much to handle, as the Bulldogs (7-4-0) hounded the Minutemen 7-4. Leonard returned to the goalkeeping position for the showdown, letting in seven goals, while saving 21 pucks from passing the line. 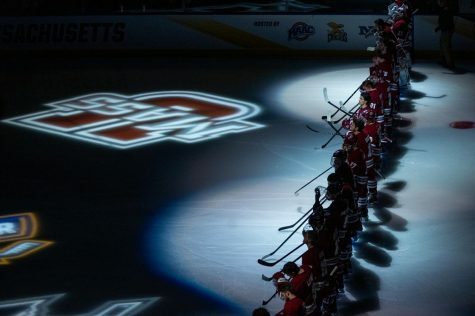 With the last of UMass’ home games in the books, the Minutemen went on the road looking to secure the NECHA West. The two games left to play were against Westfield State and Keene State, two teams that UMass had defeated earlier in the season. The game against the Owls (4-8-0 NECHA West) ended 4-2 in favor of the Minutemen. Forward Kevin Joyce earned a pair of goals (11 on the season). Powers meanwhile earned two assists, which brought his total for the season to 15. 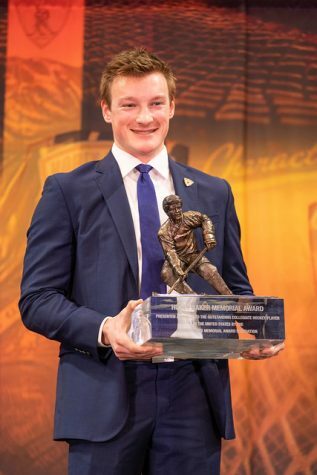 Joyce has two game-winning goals this season. 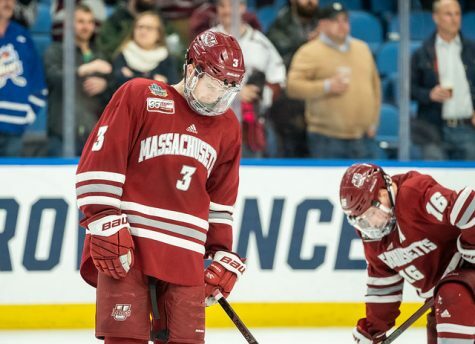 Looking to end its season on a high note, UMass downed the other flock of Owls (4-7-0 NECHA West) by the same score of 4-2. Goolsby and forward Chris McKenna each finished their regular season in a strong way, notching a goal, and each had an assist. The club hockey regular season is now over for the Minutemen, with playoffs starting on Feb. 27. UMass won the NECHA West division title after securing victory over both Westfield and Keene. With the NECHA regular season still not over, the Minutemen await to find who they will compete against in the regional playoffs. 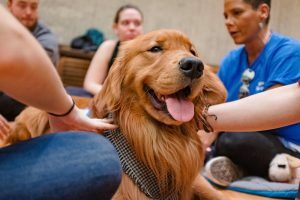 Behind them in the NECHA West standings are Connecticut, Western Connecticut, and Vermont.